Seattle is coming apart, and only one hero can hold it together. Fresh from her recent miniseries (see Black Canary (1991 1st Series) #1-4), Black Canary returns in an ongoing title chronicling the exploits of a streetwise, tough-as-nails hero. 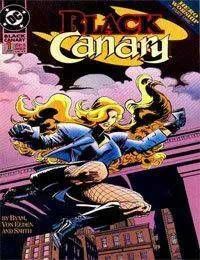 Black Canary begins her monthly adventures with the 3-part story arc Hero Worship, as Dinah Lance is forced to relive her own origin while investigating a rash of homicides. This leads her into a confrontation with an underworld mastermind whose latest scheme has gone out of control. It becomes a race against time that Black Canary must win before more people die.